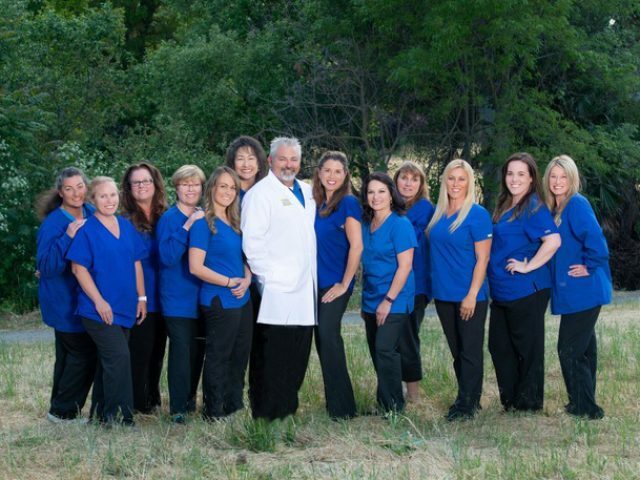 Our team consists of a group of wonderful people here to serve your needs from the moment you walk in our practice. You’ll feel comfortable and cared for throughout your visit. Not only will you receive the best possible care for your dental needs, you will also have the best support in understanding your insurance benefits and how to coordinate everything you may need. Everyone stays up to date with the latest techniques, research and technologies to see how they will benefit you, our patient. Your oral health is our first priority. Here’s a little more about our dental family. What's the Difference Between An RDA and An RDAEF? An RDA is a Registered Dental Assistant and an RDAEF is a Registered Dental Assistant Extended Functions. The RDAEF goes through an additional year of school and must pass a State Board exam with their dentist to be accredited this title. They work closer with Dr. Loftin. Think of them like a physician’s assistant. It’s a unique position and they work very hard for this certification. We are lucky to have two RDAEFs at Loftin Dental, Jennifer and Tabitha. What Does This Mean for You and Other Patients? RDAEFs allow us to be more agile in our practice and to attend to more patients in need of complex procedures. This includes fillings, adjusting dentures and other services. Each RDAEF works closely with Dr. Loftin and are fully capable for these and other advanced treatments. Dr. Loftin attended the University of California at Berkeley for his undergraduate education and then the University Of California School Of Dentistry at San Francisco (UCSF). At UCSF, Dr. Loftin expanded his education by becoming laser certified and practicing minimally invasive dentistry which is a highly used conservative approach in keeping patients’ mouths healthy. Post-graduation he continued to add to his education and received certifications in Cosmetic Dentistry, Invisalign, implant placement and restoration, and oral conscious sedation. During the last 15 years, he has had a multitude of successful cases, from simple restorations to cosmetic veneers all the way to full mouth rehabilitations. He is well versed in general dentistry, cosmetic procedures and more complex mouth reconstruction. 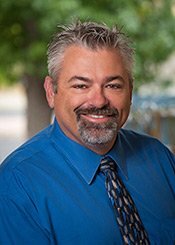 He has been an active member of the California Dental Association, the American Dental Association, the International Congress of Oral Implantologists and the Academy of General Dentistry. When he is not practicing dentistry, he enjoys golf and playing on a local softball team and bowling team. Dr. Loftin and his wife, Zulay, are also on the ‘Great Balls of Fire’ Bocce Team headed up by Wendy Moore and play in downtown Clayton, California, during the summer session. He also enjoys spending some quiet time with Zulay in Napa, Sonoma or Carmel for some wine tasting. He also has a bit of the travel bug and hopes to visit new places every year with his family. Being an avid golfer these days, he and his son, Jaxon, are able to practice hitting balls and playing a couple holes here and there at different golf courses. A favorite course is near his father’s place in Pioneer, where they can head out towards the end of the day and try out a few holes …without bothering other golfers! Jaxon has been really enjoying the one-on-one time with his ‘Papa’, especially now that school has started at EaglePeak Montessori! He is a member of the Concord Clayton Sunrise Rotary and has really come to enjoy the part of his life where he is able to give back to the community he loves. Dr. Loftin is a gentle and caring Doctor that will work with you to ensure you are receiving the treatment that best suits your needs. He feels privileged to care for children, adults and those with special needs. We were honored to work with Dr. Albert Martin, Jr., DDS as he transitioned into retirement. As of August 2014, he did happily retire. Thankfully he and his wife, Renee, still come to visit us for their regular dental checkups and catch up lunches. They have been enjoying time with their family, especially their newest member – a granddaughter! Traveling is another norm for them as well. Fun times! He had been at this location on Washington serving our Concord community for over 30 years. We held a small retirement dinner for him and our team where we presented him with a signed framed picture – his first team and his most recent. We had the picture up in our practice for a while gathering as many signatures as we could! We also ‘retired’ one of his jackets and placed his last name and the year he retired on the back of it. The start of the transition began in 2010. It started with monthly lunches where they would talk and get to know each other as people and as clinicians. Because it was important to both of them to have a smooth transition, Dr. Loftin began working one day per week and worked side by side with Dr. Martin spending quality time getting to know his future patients and team. This went on for 2 years. Then yay – the time came and we became the new Dr. serving our Concord community. Dr. Loftin has over 10 years of experience working in multiple locations and found this location perfect to serve. He & his wife are very excited to work with everyone and continue the great service Dr. Martin has provided. So even though we are “newer”, we have a long history in this community that we look forward to continuing & growing even better. We’re looking forward to the next 30 years +! A: Being able to help others when they’re in pain. Also, giving them the smiles they have always wanted. Q: Who will you always go see in concert? Q: What are your hobbies and passions you like to do during your time off? A: Love golf and wine tasting with my lovely wife. 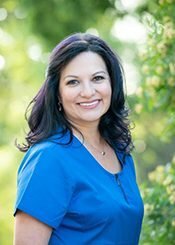 The thing you immediately notice about Zulay is her passion for the patients and staff at Loftin Dental. 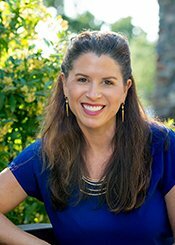 For over 15 years, she’s been running the practice with a focus on creating a warm and inviting environment for all. Zulay will tell you that the best part of her day is working with her husband and the amazing Loftin team while caring for patients. A graduate of College Park High School and Saint Mary’s College, Zulay has a CPA degree and excels in marketing and HR. When not working, she enjoys time with family, dining out with friends and, when possible, rest! Her greatest achievement is balancing happiness at work and at home with her husband Todd and son, Jaxon. A: Being true to myself. A: Christmas…lots of family, crafts and gifts. 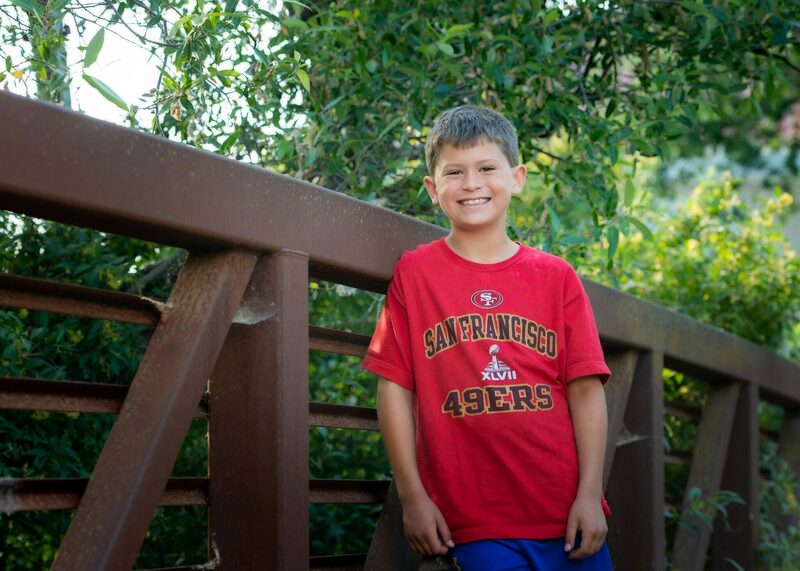 The first thing to know about Jaxon is that he loves the 49ers almost as much as he loves his chocolate lab, Shasta! When Jaxon is not in school or playing football or basketball, he’s helping out at Loftin Dental. He’s the official ambassador of Loftin Kids Cavity Free Club. For all kids who don’t have cavities, we’ll enter their name into a monthly drawing for prizes ranging from gift cards for Barnes & Noble, iTunes, Yogurt Shack, Disney, Claire’s, Game Stop to movie tickets and more! A: When I won a basketball trophy. Q: If you could be any character from a movie, who would you be? 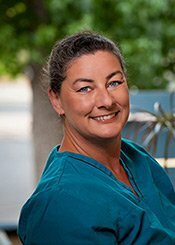 Jannie has happily been a Hygienist since 1983 and has been working with Dr. Martin since 1984. 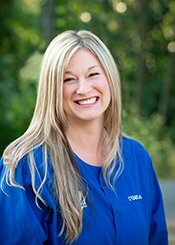 She went to DVC and is currently part of the American Dental Hygienist Association and the Mt. Diablo Dental Hygiene Association. Jannie has always been interested in health. One of her friends was a dental hygienist and inspired her to follow into this industry. 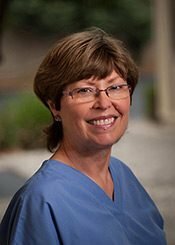 This was a great choice, as she truly enjoys her patients, especially visiting with them and helping them improve their oral health. When she’s not at the practice, she has her grandkids to keep her and her husband busy, along with her loves of photography and dancing. Heather has been with us for a long while; first as a patient and now as our Hygienist. She went to school locally at Diablo Valley College. We get to see her kids just as regularly but now they get their teeth cleaned by her! Michael (9) and Makayla (5) both enjoy that a lot! The part of her job she finds most rewarding is when she’s able to be a part of her patient’s journey from having disease to having a healthy mouth. The benefits are endless and she likes knowing she had a part in that process. Her goal to give you the best experience possible and keep you healthy! When she’s not with us, she likes going on weekend trips with her kids or just hanging out at home. She plays the piano too and has recently began to teach her daughter how to play. 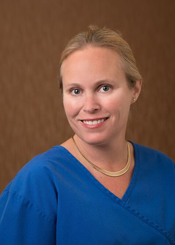 Now at Loftin for 3-1/2 years, you’ll find Regina taking great care of patients Thursdays & Fridays. She went to school at Darton Hygiene School in Georgia and Loma Vista for her RDA license. She lives locally with her family on a small farm with horses, goats, bees, ducks and chickens! Regina’s proudest achievement is her 3 beautiful daughters Samantha, Lila and Madeline! Q: How would you describe the atmosphere at Loftin? Three words that describe Mariza are loyal, playful and generous. Her favorite part of her day at Loftin is working with an awesome crew of not just co-workers, but friends who make coming to work enjoyable When not at work, Mariza spends her time with her three boys at baseball and football games or places like the beach. The family loves camping, swimming and amusement parks. She’s also an avid reader, loves to bike and take walks. She especially loves visiting wineries nearby including Livermore and Napa. Q: What do you like best about living in the area? A: I truly love the view of Mt. Diablo during any season. It’s just a majestic and beautiful view. Cannot get enough of it. A: I would have to say Thanksgiving. It is such a cozy and intimate holiday time with my family. I love to cook and prep for our feast. Wendi has been with us since 2017. She’s been an RDA for about 20 years having received her training at Loma Vista. She loves laughing with patients and making them smile. When not working, Wendi loves spending time with friends and family. She also loves painting, cooking and enjoying a good concert with a craft beer. She considers her greatest achievement her two kids and husband, being a good friend and a love for animals. A: All the kiddos love me at work. I’m goofy and everyone calls me “Bubbles” at work because I’m always happy. A: Very fun and comfortable. 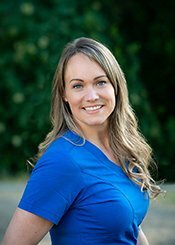 Jen has been with us since early 2013 and credits Dr. Loftin as the best dentist she’s ever worked for. 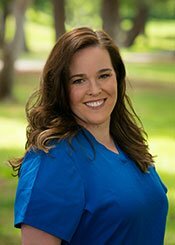 Since 11, Jen has had her eye on becoming a part of the dental profession. After graduating from Clayton Valley High School she headed to Bryman College for her RDA training. Then she headed to Sacramento City College for her Extended Functions (EF2) training. Jen has two beautiful daughters. Haley and Hannah. During her time off she loves playing with her French Bulldog puppy “Whiskey”. Q: Who will you always see in concert? Tabitha has been with us since 2008. She went to Western Career College for training and is currently a member of the American Dental Assistant Association. Tabitha says the best part of her job is helping patients have the best experience possible. The three words that Tabitha says describes her are horse-crazy, driven and passionate. She is all about horses whether its riding, showing or training them. 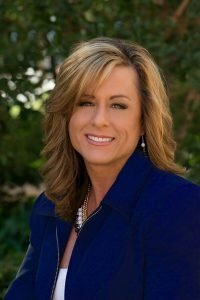 In fact, Tabitha established REINS (Red’s Equines in Need Sanctuary) located in Hollister, California, to help neglected, abused and abandoned horses in need of a safe environment in which to recover and either be placed in a new forever home or a loving sanctuary to live out their days. Now that’s commitment! Learn more about here: www.helpREINS.org Follow them on Facebook: search for REINS. Q: What should people know about Loftin Dental? A: Doc is very good at what he does. He has a great chair side manner. Robin is Loftin’s newest team member and she’s fitting in nicely! Her favorite part of the workday is interacting with patients and working with Loftin’s great team. When she’s not at work, Robin loves weights, water skiing, growing plants in her greenhouse, and hiking with her husband, Bob, and son, Aaron. Fitness is her passion. In fact, she and her husband own a gym, Clayton Fitness Center! Her guilty pleasure is “raising the bar and breaking my own fitness records in weight training.” Robin’s “fur babies” are Cody, Joey & Rico. All rescues! Q: What’s your proudest achievement? A: Helping my son overcome his health challenges and watching him grow into a wonderful young adult. A: Fighting for the rights of others. Being a liaison for the right thing. Not taking no for an answer.